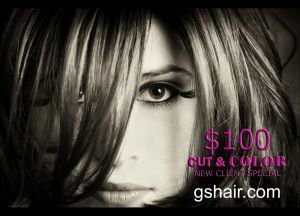 A special offer for GS HAIR for new clients. This offer good for new clients only. Limited time offer. Spring 2016 New Client Special expires 3/30/16. Call today to schedule your Spring 2016 New client Special with Sacramento’s Best Stylist. For a limited time we are offering a precision haircut and luxurious new hair color by Vidal Sassoon Master Stylist Greg Saumure for just $100. That’s a $35 discount. Or book your hair cut, hair color and high light appointment for just $150. (Does not include Balayage) This offer is good for any new client. We only offer new client specials once a year and they expire quickly. Greg Saumure is a Master Hair Stylist and Hair Colorist with over 30 years experience. He has worked behind the chair in Sacramento as a stylist, colorist, educator and lastly owner of one of Sacramento’s Best Salons. He has launched careers of hundreds of local stylists through his rigorous training and education program. He is also one of the few Vidal Sassoon Alumni in Sacramento. Read about the difference between Vidal Sassoon Alumni vs. Vidal Sassoon Certificate holders here. He has earned his loyal following of clients through a life-long commitment to exemplary customer service. We hope that you’ll be one of them. Read more about Greg Saumure here. *$25/bowl extra color still applies. Offer effective today through March 30, 2016. Cannot be combined. Gift Certificates Available, just call ahead. Consultations are always free. Just call and let us know you’d like to meet us for a FREE consultation. Offer only good with Greg Saumure. Check out dramatic before and after videos of Greg’s work on our YouTube Channel here. GS HAIR MASTER on Youtube.